Both elegant and inviting, this classic pattern serves as a wonderful complement to casual and relaxed dining environments. Constructed of extra heavy weight 18/8 stainless steel, this serving fork also boasts a bright mirror polish, attractive rounded rimmed handle and four-tine design. The item measures 8 1/2" in length and will add a classic touch to any dining area. The 8 3/4” stainless steel serving fork is very shiny and of good weight which I feel is very important especially when serving foods for guests. The Regency Flatware eight and one-third inch stainless steel serving fork is the size is perfect for any buffet line or any time you need to serve large quantities. Besides meat, I have used it with heavier contents like brown sugar sliced ham I hope to see more serving utensils. Very durable and would recommend. This fork is a great size for serving small dishes or help with carving meats. It has average weight and does not bend too easily. These stainless steel forks look great on table settings. Very good quality and sturdy! The price is reasonable for how long this items is going to last. Washes well in the dish washer as well. The Regency Flatware Stainless Steel Serving Fork brings an extra touch of class to serving and presentation while keeping the budget well under control. These forks look so much nicer than common stamped forks but cost only a little extra. One of the best small serving utensils in my bag. Great quality and looks great also very posh and appears it will last quite a long time. Beautiful detailing on the handle and the tones have good size. This one is a keeper and will buy more. These serving forks are great, solid, heavy and durable, there’s a lot of cheap inventory out there, wasn’t sure what to expect, so happy with this product I bought a bunch more. We use in our dining room when serving Calamrari, Sausage and Peppers, even chicken dishes on or off the bone Family Style. The Regency stainless steel serving fork is a great serving piece and is terrific for our carving stations. The forks are well priced and we have multiple on hand at each event we cater. We are thrilled at the find and quality. We like this size stainless steel serving fork. It is comfortable in your hand and can hold a nice piece of meat without being afraid it will drop off the fork. It is excellent for use on any table. After 5 years of regular use by groups of 50 young kids, these have held up well. Only a few have been bent during that time and they clean easily. We are a design company and we design and decorate a lot of vacation homes in Florida. We use it at the vacation homes, since it has a quality, durable and resistant. And the delivery was just perfect and every time we need to replace an item, we'll always find it here. Fantastic serving fork. Works great for family style dinners. This fork also pairs well with the matching spoon if you like metal salad servers. The only downside might be that the tines are a little large, so they don't work great for very small or tender items. Beautiful serving fork. It really shines and keeps its shine once washed in the dishwasher. It doesn't get faded or cloudy at all even with when washed with really hot water. This is a great serving fork, and can also be used as a carving fork. I think that the size is perfect for either of these uses at 8 1/3" long. The fork is made of heavy duty 18/8 stainless steel and feels great in your hand. It is substantial enough that you can serve meats or other heavy foods and it does not bend. The handle has a simple line imprinted around the outer edge, which I think looks good in both casual and more upscale environments. Great for serving carved meat! Used these for a formal event and they were perfect. They were a little smaller than I anticipated, but definitely got the job done. I love this brand! I've purchased not only these forks, but the serving and slotted spoons as well. They are all very sturdy and look very professional. I'm happy with this purchase! Purchased for use in our catering business and we are very pleased with the quality of these stainless steel meat forks. They are attractive and durable. These serving forks are nice enough to use at a fancy dinner party or even a wedding catering. We prefer to use stainless serve ware instead of plastic. This fork is made of durable stainless steel and features a shiny mirror finish. They serving spoons can be washed in the dishwasher to make cleanup quick and easy. 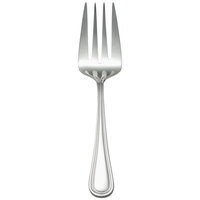 The Regency Flatware Stainless Steel 8 1/3" Serving Fork is elegant and great for dinner parties or fancy restaurants. It is well made and sturdy. I added silver or gold wire wrap with Czech beads and sell the slotted spoon as a set with the serving spoon and serving fork at a boutique in Breckenridge, Colorado. Everybody loves the quality of the serving pieces. I love the Regency flatware line because of its affordability. I’m not sure how Webstaurant is able to offer such high quality at such a low price, but I appreciate how heavy they feel and how polished the finishes are. This is a great addition to my serving utensils. Bought this along with the matching serving spoon and they are the perfect addition to our utensil set. Very heavy and well made - would recommend for any household or kitchen. The regency series flatware is all incredible. This serving fork has the look and feel of ones twice its price. Great design and finish on this serving fork! Excellent utensil that does just what is advertised. Very heavy duty for the price, I see myself using this for years to come. A steal! This is a nice weight serving fork. It is a heavy enough stainless to feel sturdy when using it to serve even the heaviest meats. I love this Regency flatware Stainless steel serving fork. It's beautiful and will look great on your table. I highly recommend purchasing some of these forks. This serving fork is strong and feels sturdy. I was able to pick up a 8lb pork roast with no problems. I like the elegant look of it as well. This is actually a quite nice serving fork. I was expecting it to be lighter and thinner but it feels good in the hand and seems very solid. The polish is nice and shiny. I will be buying more serving flatware from this company because the value is fantastic. This 8 1/3 stainless steel serving fork is awesome. Who doesn't need a serving fork in the kitchen?! You can use it for assistance in cutting meats or to help scoop out food such as salad and casseroles. Can't say enough about what a great price for such a beautiful serving fork! We have these serving forks and spoons at our home as well as our restaurant. Good looking flatware! Great for caterers because their pattern is not so ornate as to become difficult when compiling with other utensils. Heavy build and durable, wont have to buy more! Great fork. It is definitely high quality with a low price. The fork is strong and looks very pretty. I am so glad I took a chance and purchased it. Perfect for family dinner, I don't like use the long handled serving spoons at home so this size works just right. Nice polished shine looks elegant. Very nice addition for your place. Gives a nice polished appearance. Your customers will enjoy the feel of these in their hands while dining inside your establishment. I purchased these forks for use on a buffet line, and could not be happier with the quality. They are perfect for any occasion, from casual to fancy. If you are looking to put together a nice presentation on a budget, there is no way to beat this, especially when paired with the 8 1/2" spoons. I chose the Regency pattern for my entire set and I was delighted to fine these serving pieces. This fork is not too large and pierces food easily for serving. Looks elegant. This is a great serving fork - very durable and made for using often. Finish does not fade or tarnish with many washes. Nice size - not too large. This serving fork looks and functions like a much more expensive piece of flatware. It has a nice finish and a strong handle...It would be at home on any buffet or in any serving dish. I am going to purchase another to have on hand...I definitely recommend! This is a very nice serving fork from Regency. It is very thick and smooth. Feels good in your hand from shape of handle. Very nice price for a high quality serving fork. Lovely serving fork that looks great with the set. We use it to serve all of our carved meats. It is very affordable and durable. This serving fork is beautiful, well balanced, and nicely sized. The bright finish and simple elegance of style make me proud to have these forks for everyday use and even prouder to use them on special occasions where their beauty is noted by extended family and friends alike. Thank you for making this pattern available to the general public. Because of their affordability, I bought 3 of these forks so I'd be sure to have enough for holiday meals when members of our large family gather to enjoy a variety of foods which call for nice serving pieces. The Regency SS fork is elegant in design and lasting in shine. 3 years of daily use and washing has not left any residues, stains or discolorations. The fork is relatively heavy and holds well. Great product. Beautiful serving Fork. Matches the rest of my cutlery. And it is big enough (not always the case with some of my other serving forks) to really let people know it's there. I think it's elegant looking and I love the quality of the Regency Stainless Steel. Thanks for carrying this line. The Regency Stainless Steel Serving Fork is a great addition to my serving utensils, and matches the Regency flatware. Great size, and attractive design. Very happy with this purchase. These are very nice, a nice weight.I bought them to bead, they look great next to the serving spoon, butter knife and boullion spoon. I beaded them all as a set and love how nice they look.. When I ordered my set of all of the serving utensils here on webstaurant I was not expecting their quality to be even half of what it has turned out to be. They are an absolutely great product especially for the price! This serving fork is great. I use it for serving meats like pork and chicken. It holds a lot and is easy to clean. It matches the rest of my regency silverware. An elegant serving fork made of high quality stainless steel. I like the smaller size, because you can use it in situations where a larger fork wouldn't work. Very nice. Beautiful as always, but strangely flattened compared to the design of the table forks. Not really an issue -- just more of a comment on what to expect. Love this product! Very sturdy! I use these for crafting and I will never change the product! I wrap them with wire and beads for a great addition to my table! These are a very nice quality serving fork. They would match perfectly to the serving spoon from the same line. great for french or even russian service. I have purchased every item in the Regency line and could not be more pleased. I have decided to replace even my at home silverware with these, they are so classic and beautiful! A lovely match to the serving spoon. We liked the simple pattern. The fork is attractive and easy to keep clean. I only wish there were matching tongs! I love these serving spoons. I have a full service in the Regency pattern. All of the utensils are heavy, well-made, and simply elegant. I highly recommend this flatware.